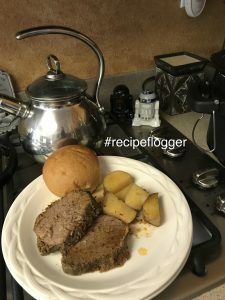 Well Flogger s, you know I love to crockpot! So, when I got my new Black + Decker Portable Digital Slow Cooker model SCD4007, I was in heaven. 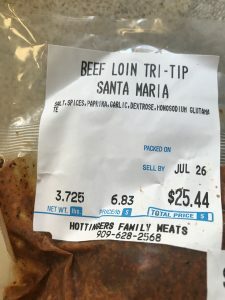 I picked up a family favorite, the Santa Maria Tri-Tip from a “localtarian” butcher shop, Hottingers located in Chino, California. It’s like traveling back in time. My grandfather shopped there, my father shopped there, and now I shop there too. I love it. Great meats at mostly great prices. The Tri-Tip is super easy. 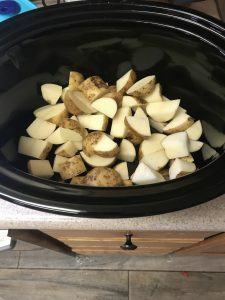 Just wash and cut up some potatoes then plop the delicious Tri-Tip into the slow cooker. Now, I set the timer and I’m off to the races. While the yummy concoction is slowly cooking away, I’m free to do other things. Since this was a Sunday, it was fun day. Hanging out with the kiddos and the hubby while doing the chores and taking care of the yard. I put it on low for seven hours (could have been done on high in 3 1/2 hours), but I wanted the smells and the extra time. 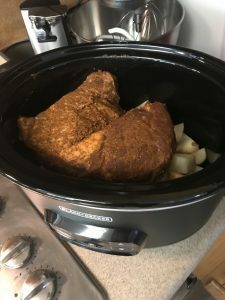 Nothing like the smell of a slow cooker. After the ti mer went off, some easy cutting and I served the entire family with enough left over for Grandpa and lunch for myself. This is a favorite. Easy breezy, super yummy. Previous Post: Is There a Bad Way to Make Chili? ?